The universe is both creative and cyclical. The very nature of the feminine is also creative and cyclical. Our bodies can create and nourish life, and is in tune with the rhythm of the universe. In Many Moons with Ajeet Kaur, we will tune into that rhythm, where our feminine spirit will blossom. Whether you are a maiden, mother, or wise woman, we all carry within us a sacred monthly cycle. This cycle dictates our emotions, our energy levels, our creative capacity, and how we show up for ourselves and others in the world. In Many Moons, we will deepen into our connection with our monthly cycle, noticing how it impacts our lives on a daily basis, and making any adjustments that we need in order to nurture ourselves and improve our quality of life throughout our monthly cycle. In Week 1 of Many Moons, we will bring a lot of love, awareness and support to our physical body, including the glandular system by practicing a yoga set for hormonal balance, as well as begin tracking our monthly moon cycle. 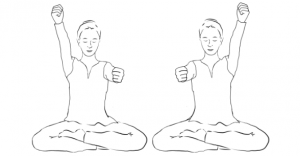 This yoga set strengthens the nervous system so that we can adapt and handle the stress in our lives with more ease. It also balances the glandular system, including our hormones. Regular practice will strengthen your mind and your body, making you both physically, mentally, and emotionally flexible. 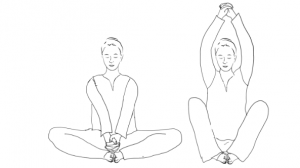 Many Moons offers a full practice video with Ajeet, along with downloadable written instructions for this kriya! 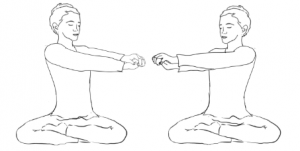 Moon Centers are located in the physical body, but are also energetic spaces within us. As the name implies, these Moon Centers are responsive to lunar energies. Understanding our emotions relative to these Moon Centers can help us to best utilize our time and energy, and bring more love and compassion into our lives. 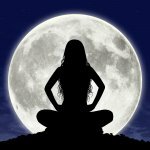 The tradition of Kundalini Yoga teachers that everyone, both male and female, have a moon center at the center the chin. 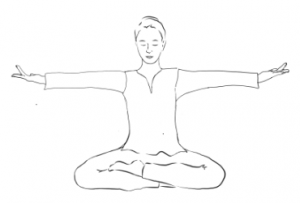 If you have practiced Kundalini Yoga meditations, you might have noticed that for many of the meditations that relate to a lunar quality, we will focus on the center of the chin as a way of aligning with the lunar energy. Women, however, have 11 additional moon centers in their bodies. We cycle through these 11 Moon Centers every 28 days…staying at one Moon Center for 2.5 days, then moving to the next one. Every woman has her own unique Moon Center cycle. 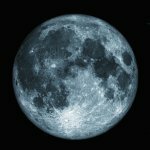 In Week 2 of Many Moons, we will begin tracking our personal Moon Center cycle, and practicing a meditation along with Ajeet to balance these Moon Centers, so that we are able to embody the positive aspects of each center and make the most of our unique monthly cycle. We hope you will join our circle – let’s explore our unique rhythm surrounded by the love and support of our sisters worldwide. What Are the Moon Centers?